We've all been there. First you start following a couple people on Twitter. What's the harm in following a couple more? Next thing you know, tweets are flying by faster than you can say "hashtag," and now you're backed into a #corner. It's natural to go on an unfollowing spree in cases like this. Why not? Those friends who use Twitter like a chat room probably won't notice, and if they do, you could just blame a Twitter fail whale. But the truth is, you don't have to. Instead, turn to plentiful apps, options, and tools to gracefully manage Twitter and keep tabs on as many accounts as you want. A key distinction on Twitter is that you can choose to either follow an account, add it to a list, or both. Following someone is the typical behavior—it means his or her updates will appear in your main Twitter timeline. Alternatively, you can create a list, add accounts to it, but not actually follow those accounts. Tweets from those accounts don't appear in your timeline, but if you're using the right Twitter app, your lists and the tweets therein are just a couple clicks or taps away. By adding accounts to Twitter lists, you can basically create alternative timelines for just about any purpose you can think of. I've made around a dozen—some for business, some for pleasure—and I subscribe to five or six lists from others. One list I created is called simply "Apple News," and it has ten or so accounts that keep me in the know. On another list, called "humor," I add comedians who are great for a laugh, but who I don't want to constantly follow with my main timeline. Another one of my lists is private, called "must read," and it's a collection of close friends whose tweets I don't want to miss. Use Twitter lists to create alternate timelines of tweets from people who talk about your different interests. You can include an account in a list without following that person. Find a tweet from an account you want to add to a list. Click the avatar (or picture) that appears next to the tweet. In the menu that appears, click Add To List. The Your Lists window appears with a list of any of your existing lists. Choose one of these or click Create A List. If you're making a new list, give it a name and optional description, and then choose whether you want the list to be public (so other people can find and subscribe to it) or private (just for you). Click Save List. You can now unfollow the person if you choose, because his or her tweets will appear in your new list. There, don't you feel a little better already? To access your lists at Twitter.com, click Lists. To see the lists someone else has created, go to his or her Twitter page and click on the Lists link. Click on a list to see the option to follow it. On the iPhone, look at Tapbots' $3 Tweetbot (my personal favorite since it debuted in April last year), Stone Design Corp's $3 Twittelator Neue, and Twitter's other free client for Mac and iOS power users, called TweetDeck. On the iPad, Tapbots' $3 Tweetbot for iPad ( ) offers a strong choice with easy access to lists and other tweet management tools. DW:design's $4 Tweetings and Naan Studio's $5 (free with advertisements) Echofon are also decent options for managing and reading your Twitter lists. Good list experiences are a little slimmer on the Mac. Take a look at Naan Studio's $5 (free with advertisements) Echofon and YoruFukurou Team's free YoruFukurou ( ). Muting Twitter users or topics is a great way to get a temporary reprieve from a chatty tweeter or a topic you want to avoid. Let's say you like the current flock of Twitter accounts you follow, but every now and then a handful of them get chatty. Maybe they liveblog dropping their kids off at daycare too often or they can't resist jumping in on every hashtag that rises up Twitter's trending list. 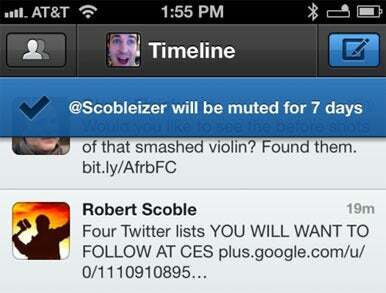 Whatever the reason, some Twitter clients offer the option to mute things like users, hashtags, or even clients. This is useful when you don't want to see any posts from anyone about, say, football or Foursquare, as well as for uniformly giving Instagram photos the boot. Now, I should note that Twitter does not yet officially support any kind of "mute" feature, much to the annoyance of many of its users. But some apps offer the feature anyway, including: Echofon for iPhone and iPad, as well as Echofon for Mac; Hibari; Tweetbot, both iPhone and iPad versions; Tweetings; and Twittelator Pro for iPhone. Generally, mute options are offered in increments of time such as a day, a week, a month, or forever. So yes: if you really need to, you can give in to that one really persistent friend begging for a follow, but never have to actually see his or her tweets—as long as you use an app that supports the mute feature. Who says you have to follow anyone at all? Plenty of people use Twitter as nothing but a research tool in addition to, or in lieu of, their personal aspirations for tweetness. Terrible lingual puns aside, one of Twitter's other useful management tools is "Saved Searches." These let you see what everyone across all of Twitter is saying about a particular keyword. Use Twitter's saved searches feature to keep track of what everyone on Twitter has to say about a topic (either a hashtag or a search string). Enter a keyword like iPhone in the search box at Twitter.com or get fancy with your search terms for even more precision. Then, click the gear menu next to the search field to save that query for easy access later. (Depending on what version of Twitter.com you're seeing, you might need to follow a slightly different process. If you can't find a gear menu, look below the search field for a button labeled Save This Search. Click this.) 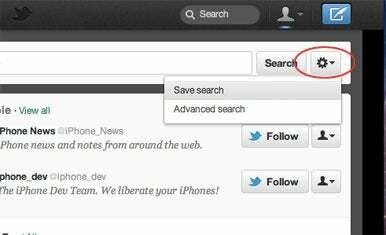 Now, when you want to access your saved search, click the search box and it will appear in a drop-down menu. (Or, if you're seeing the old version of Twitter.com, click on the Searches tab near the Timeline tab.) Like the rest of Twitter, saved searches operate almost in real time and will display an alert when new results are available. Most Twitter clients, including all the ones I've mentioned so far, have long offered various types of advanced data mining like this. As a bonus: if Twitter just isn't your thing but you still want or need to use it for business, you typically don't need an account in most apps to use saved searches. In times of Twitter Overload, it's good to remember a saying that quickly grew from the service's early days: "You can't read them all." If organizing lists seems like overkill, but you don't want to miss tweets from a handful of accounts, maybe turning on alerts for a chosen few is more your style. A few apps allow you to receive alerts for tweets from specific accounts, among a slew of other content and services. Appremix's free Boxcar is a good choice across Mac, iPhone, and iPad. Use it to enable Push Notifications on iPhone and iPad for specific accounts. On the Mac, you can install Boxcar's client to display Growl-like alerts. Fabien Penso's $5 Push 4.0 is a competitor focused on iOS devices. It also does Push Notifications. If these other solutions aren't what you're looking for and you really do need to do some serious timeline trimming, there are a bunch of services that can help you make the right decisions. iUnfollow, for example, does exactly what it says on the tin. After logging in with your Twitter credentials, a handful of tools make it easy to find the right people to unfollow (such as users who never followed you back). There are even keyboard shortcuts to ease particularly arduous unfollow sessions. SocialBro is a sort of "social insight service" that offers a whole range of Twitter analysis tools. Among them is a Follow/Unfollow tool to help you dig into who hasn't followed you back, discover accounts that are just automated bots, and more. SocialBro can help you make intelligent decisions about what accounts to drop from your list based on who is following you back. At the end of the day, Twitter really is what you make of it. You can follow just a few friends to create your own little slice of the Twitterverse, or you can follow hundreds of accounts and deck out your lists to build a massive social media hangout and news dashboard for every facet of your life. With a couple of these tricks and maybe a new app or two, you can easily get just what you need out of Twitter, instead of allowing it to take too much out of you. Former Macworld associate editor David Chartier is a Herald for 1Password from AgileBits, chief wrangler of the Finer Things in Tech, and forever searching for the perfect hashtag.